Stoned and chopped 400g of Victoria plums. Melted 125g 46% milk chocolate in a bowl over hot water an left to cool. Mixed 200g kefir cheese until smooth. Beat in the melted chocolate and set aside. Creamed 175g unsalted butter with 200g cardamom sugar. Beat in 4 eggs one by one. Sifted in 200g flour (1/2 spelt, 1/2 white) and 1 tsp baking powder. Stirred in 1 tbsp rose water. Spooned half of the cake batter into a 9″sq cake mould. This proved to be rather difficult as there wasn’t a huge amount of batter. Spread the cheese mixture over the cake batter, then scattered half of the chopped plums on top. Spread the remaining half of the cake batter over the top and scattered the remaining plums over this. Baked at 180C for 35 mins. It wasn’t until I’d made the cake and re-read the original recipe, that I realised I was meant to put one of the eggs in the cheesecake – oops! Despite, the mishap with eggs, the result was truly scrumptious. It started with a lovely fruity hit, both sweet and tangy, then came the unctuous creamy chocolatey bit. The rose was very subtle, but left it’s mark in the mouth long after the cake had disappeared – in a nice way. 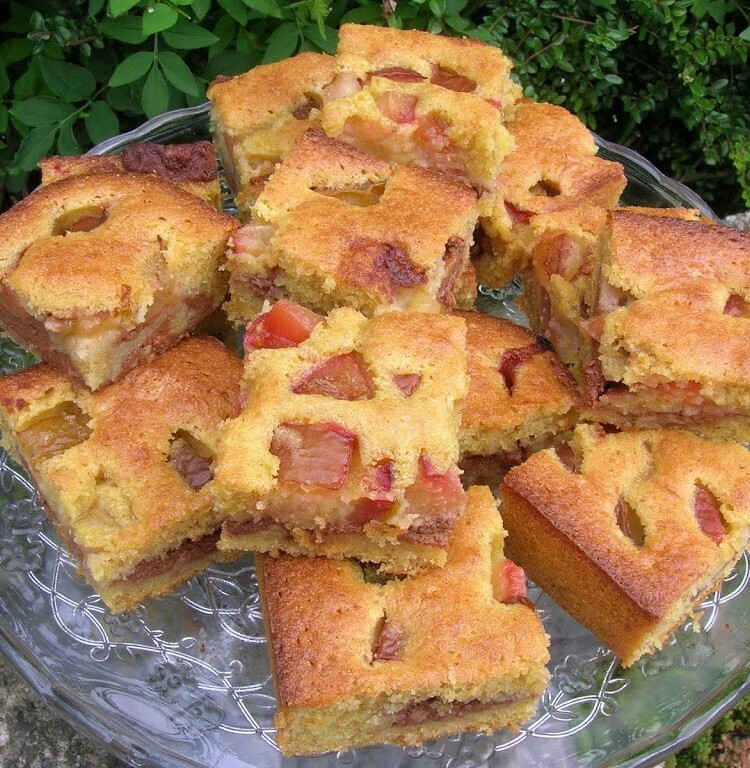 plum traybake – a thing of beauty! Both versions look great – yours and the non-chocolate original. I only used 1 teaspoon of rosewater in my small cake, which probably is proportionally about the same as you used, but found it quite a strong flavour. That looks delicious ~ what an inventive recipe idea, and I LOVE plums in baking! That looks so good! Well done you! Nice looking traybake. Yummy Victoria Plums. That looks amazing – a truly original creation and very delicious with it. I love the idea of the different layers, and plum and rose sound like a good combo, but one I would never have thought of. Suelle – thank you. I think the strength of the rosewater depends on the variety used – I’ve come across several over the years. The more “natural” they are, the more delicate the flavour. Karen – plums are wonderful aren’t they. One of my favourite things from my time in living in the French part of Switzerland was the plum tarts – have not found anything to match it since. Janice – thank you. It would be a good one for a party. C- you must have posted that comment as I was typing mine. Plum and rose work really well together – a combination I shall try to remember. Having just seen CCs plum and cheesecake, I know I’m not the only one that thinks cake, plums and cheesecake go well together either. Looks fab! Glad it’s not just me who misreads recipes! Nicola – plums do make for a nice bake, although I’m also very fond of plum jam and damson liqueur. this looks lovely. I have to say the rose recipes have been really interesting this month. Looks lovely and moist! The addition of rose makes it so elegant sounding 🙂 I may make this for a wee afternoon tea with the girlies! The cake looks so pretty! Love the use of kefir cheese here. WLM – It’s always fun finding out what how people will use the ingredients chosen, but even more so when the ingredient is a bit more unusual. Frugaldom – for kefir cheese use any cream cheese, cardamom sugar is not at all necessary as it’s very subtle, but is just a jar of sugar with a load of cardamom pods kept in it. The butter I can’t help you with. Angie – it’s the first time I’ve used kefir cheese in baking and it worked absolutely fine. Lovely! I really like the sounds of the rose and plum working together. yum – I haven’t been adventurous with rose so I don’t know if I will manage to cocoa along with rose – have been considering it but the dried rose petals are still in the closet! CityHippy, it’s a good combination and one I’m happy to have discovered. Johanna – you never know, you might be inspired by some of the recipes in the round-up. this sounds amazing:) its such an elegant dessert and i just love the flavor combo. thank you for sharing this. This looks delicious. I wouldnt have thought that the flavours would work together. I’m always mis-reading recipes but they usually turn out ok except once when I completely forgot the sugar in some cookies and I had to bin the whole lot! BlackBook – thank you. It’s a lovely flavour combination that I’m pleased to have discovered. Baking Addict – I find baking is a lot more forgiving than we’re told – either that or the people eating it are 😉 How upsetting about your cookies – it’s so easily done though.